This lovely first level end villa offers lots of light and water great views. 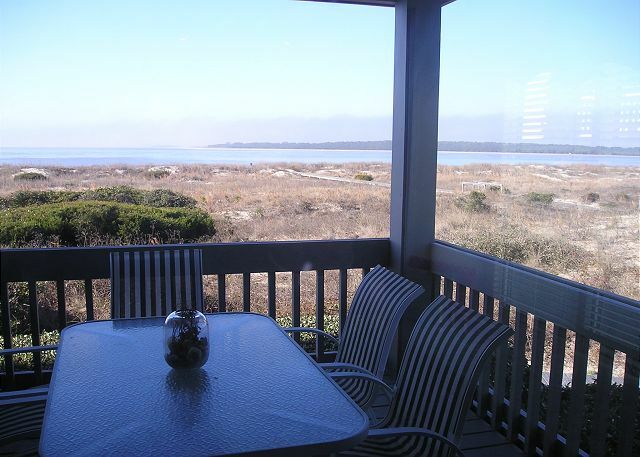 Enjoy the breezes from your covered deck looking out to the water. The bench seat in the living room is a great spot to cozy up with a book or for an afternoon nap! The living room TV has digital Comcast cable and a DVD player. This villa offers updated kitchen and baths. 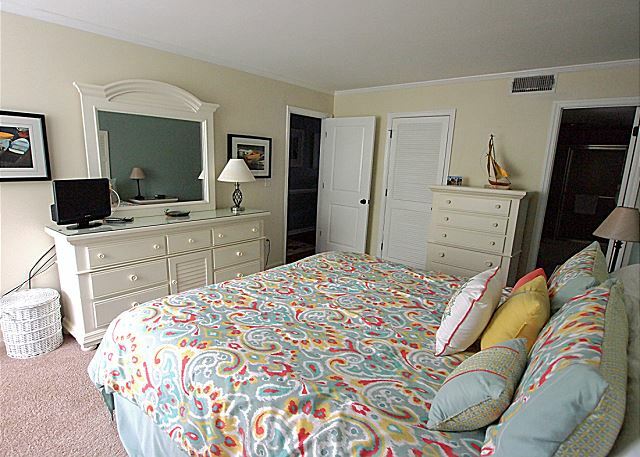 The master bedrom features a king bed and private bath. There is a second TV located here. The living room has a sleeper sofa. Wireless internet access. One dog is permitted! Wonderful Pet Friendly Rental with Amazing View!! Highly recommend booking thru Seabrook! Susan was incredibly helpful and knowledgeable. The unit has an amazing view and is a great pet friendly option. Condo is well-stocked and has everything you need. The description is accurate and it was clean on arrival. The unit itself could use some updating (in particular the carpet), but the decor is quite nice. This was our first visit to Seabrook and we look forward to our next!! Head ups if you are into adventure yet beauty and peacefulness. Very nice and peaceful. Betsey was wonderful to work with and such a BIG help when we had problems with the wifi, TV etc. Helps so much, Betsey!!!! 😊 We definitely would travel here again and keep Seabrook on our travel plans. Everything went smoothly - no issues. We love Charleston! Seabrook has always been a favorite of mine, and this trip only added to my positive feelings of the place. I’ve stayed at Pelican Watch every visit, but this time worked with Betsy at Seabrook Exclusives and she was just wonderful. She found me the perfect pet friendly unit at Pelican Watch (which has been my favorite so far) and worked with us to make sure all of our needs were met. 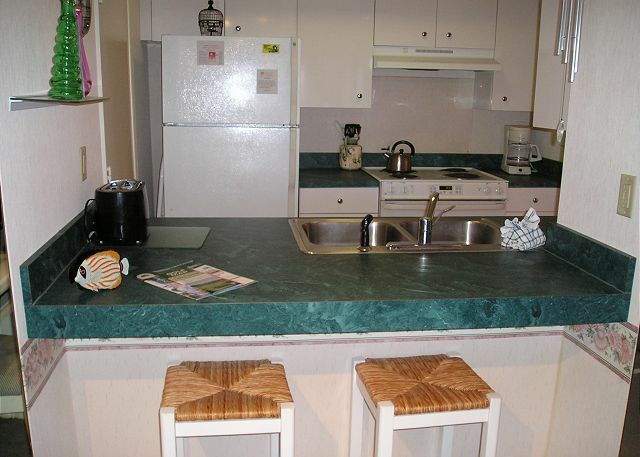 The unit was beautifully decorated, had everything we needed and was extremely clean and comfortable. Thank you so much and we will be back! 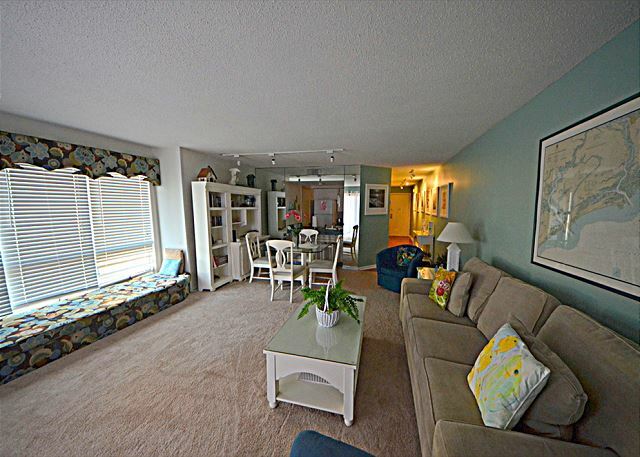 We are a retired couple with a small dog and this condo was perfect for our needs and physical abilities. 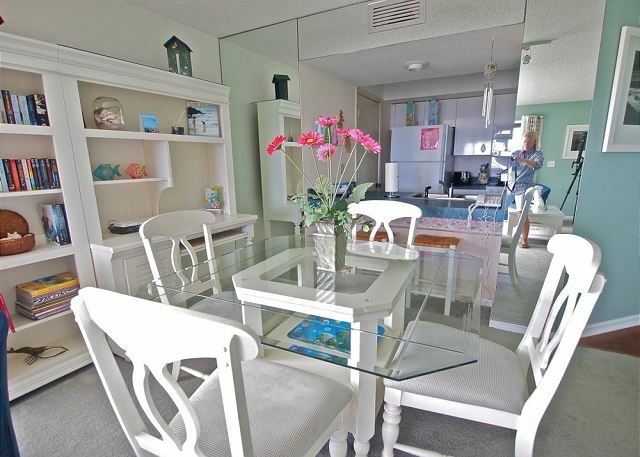 There are a few steps and a beautiful view of the water with short boardwalk to wide beach teaming with dolphin. Watch for deer on the dunes after sunrise. On really windy days we found the North Beach to be perfect. It’s white sand ocean front beach is Incredible. Bed was comfortable for us. All furnishings as pictured. Would definitely stay again. 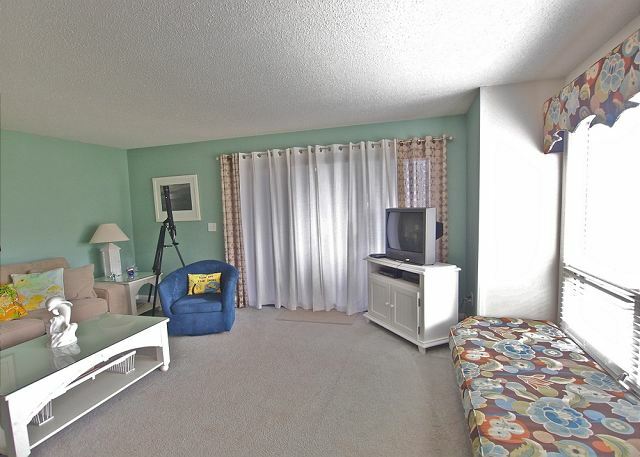 Was looking for a beach and accommodations that were pet friendly. Stumbled upon Seabrook Island and Pelican Watch and was so glad that I did. The beach is nice and quiet and low key. Our unit was a one bedroom, first floor, corner unit with more windows than an inside unit. Even though it was a one bedroom, it could accommodate probably 5 people since the window seat is a very long cushioned "bed". And even though it was on the first floor, the views were still spectacular. Loved the island and loved the options for restaurants and shopping at the marina and at Freshfields Village. Restful and restorative in spite of tropical storm Hermine's intervention on the sixth day of our stay. 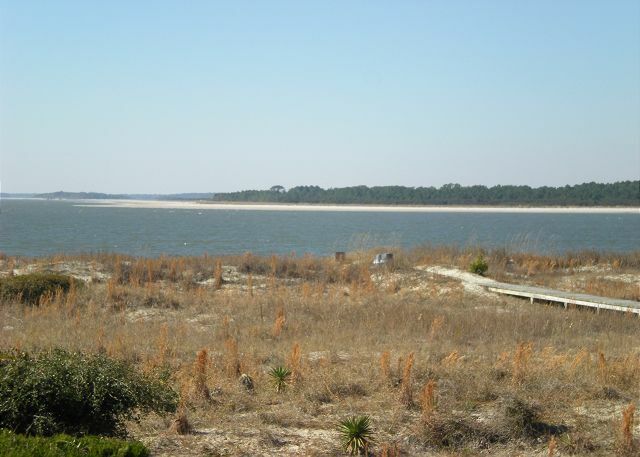 We always enjoy Seabrook, especially since it is possible for us to bring our dog with us. The deer, rabbits, and raccoons are a pretty cool bonus. I arrived ready for some zen time and photography and that is exactly what I got! This place was heaven! The access to the beach was so convenient, the place was extremely clean and well decorated. The view from my deck was spectacular and could even see dolphins swimming. The sunsets here are to die for! I had everything I needed and couldn't be happier!! I will definitely return! Wife and I enjoyed our 36th anniversary in this unit. It was everything promised and then some. Most evenings we sat on the deck and just enjoyed the sunset. This is a wonderful place to just relax for a week. The fact that this place was so pet friendly was a plus. Thanks for an amazing stay. As always, 1383 feels like home the minute we stepped in it. It is a beautiful location and hate to leave to head north. This is our third or fourth visit to this great unit! It fits us: great location, all the amenities we need, and we feel " at home." We've been renting on Seabrook for about 15 years. (We rented on Kiawah for about 15 years before that). 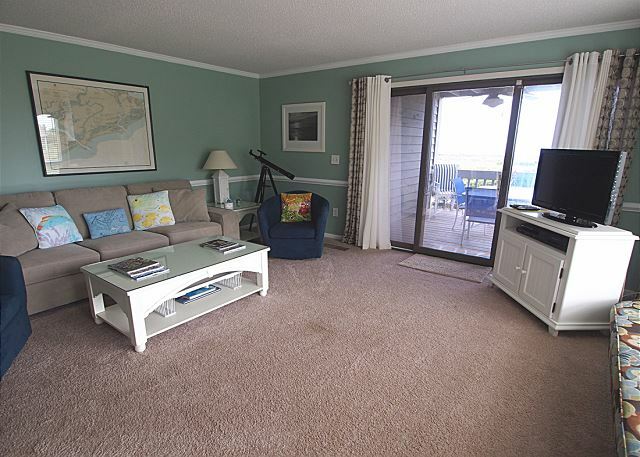 We've been so happy on Seabrook that this year we decided to go from renters to owners! 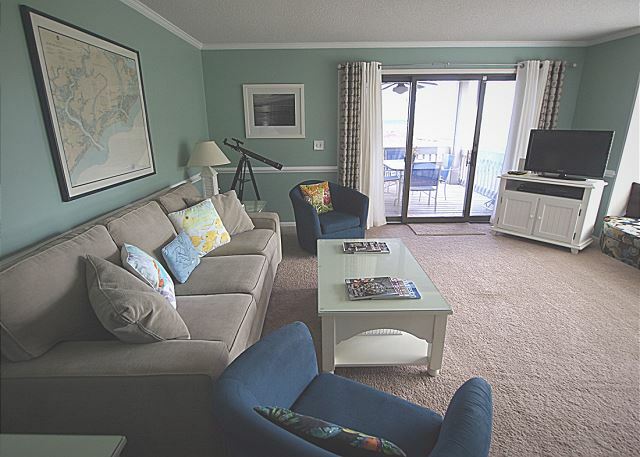 Seabrook Exclusives has always handled our rentals and they've been terrific in every way-- responsive and quick to follow up on any problem- big or small. 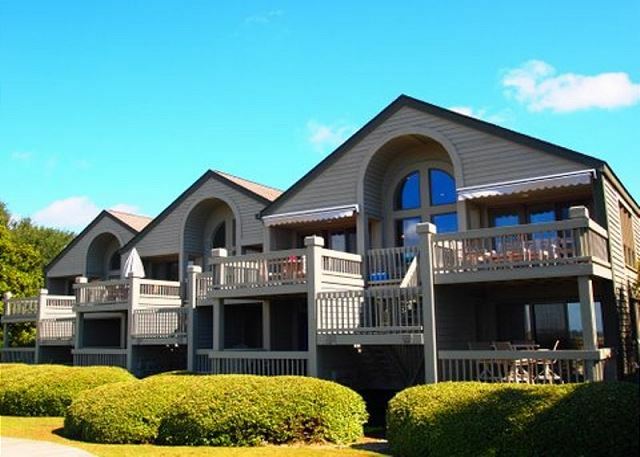 We would recommend Seabrook and Seabrook Exclusives to any one looking for a wonderful vacation. It can be as active or " lazy" as you'd like-- and fun for all ages. We started vacations there with two small children: for the past two years our adult children and their children have joined us. You'll have a great time. Unit was clean and comfortable. Location....perfect. Will go back, and have already recommend to family and friends. Only complaint would be the barking dog belonging to the owners of the unit upstairs. They were very nice and tried to quiet the dog but when they were away, it barked. This was our first visit to Seabrook but it won't be our last! You just can't beat the view and the peaceful location on the beach! Not to mention the dolphin, shark, deer, turtle and painted bunting sightings!!! Beautiful views, calm and serene. Definitely relaxing and we will be back for sure. We've dealt with the Pam Harrington company before and they are always courteous and efficient. If there is anything negative to be said, then I would say that in this particular unit, the master bed/linen/covers needed a makeover. And the hot water in the master shower did not work right. Thank you so much for your review. If you ever have an issue such as you mentioned in the master shower please let us know during your stay. We would be be more than happy to check it out. That is what we are here for. This property overlooks the ocean on one side and a large grassy area on the other, giving it beautiful views and excellent lighting. Best Pelican Watch Villa yet! Perfect weather, perfect villa. Light and white. An end unit with nice bright light. Even a fan over the porch. Beautifully appointed. We lacked for nothing. Hope to rent 1383 Pelican Watch again. We have not been to Seabrook since the early 90's when we sold our property. What a treat to come back. Loved it! Had a great time and definitely will return !!! 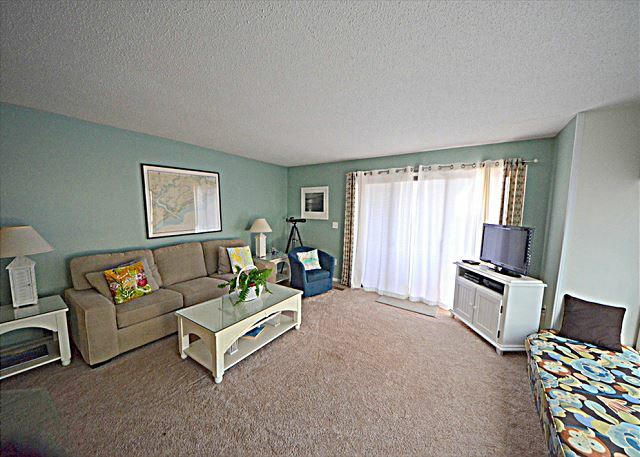 Lovely condo in an outstanding location. 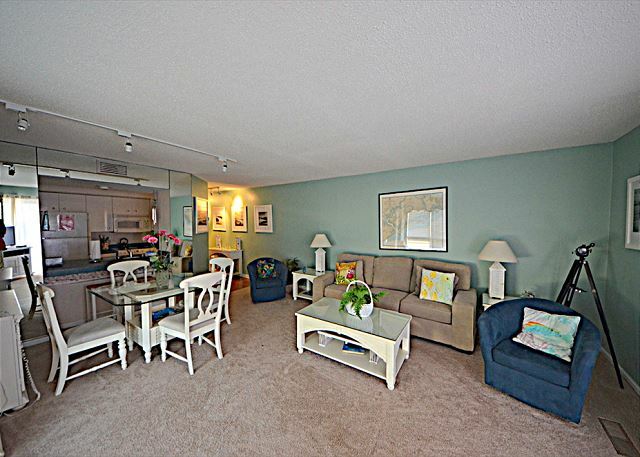 Condo is peaceful and calming with a tasteful decor. Sunny and airy with great sunset views. Great one bedroom condo. Beautiful ocean views. Clean with everything working and everything we needed. Fantastic location. Quick drive to put our kayaks in the water. We loved this area so much, we are looking to purchase our own condo at Pelican Watch!!!! We were delighted with the location. Management was very helpful and accomodating. My only gripe was that the kitchenware was a little skimpy. The views from the unit were fantastic, the unit was nicely decorated and I would rebook in a minute. Seabrook has become my new favorite place...Beautiful!! the only problem we had was trying to get into the pool/clubhouse when the guy at the gate almost won't let us in w/o a swipe card as we couldn't get one the day we had arrived (on sunday). so there should be some way to avoid this. Everything was great except the dishwasher did not work and the internet connection only worked one time. The best so far...Three years in this unit and planning a fourth! My husband and I wanted a break from the snow and cold of Indiana. We decided on the spur of the moment to go to our favorite spot in SC, Seabrook Island. We were able to book a great villa for a 3 day weekend stay with no hassle at all. I called Seabrook Exclusives on Wednesday and Kat took care of everything over the phone quickly and efficiently. We needed a villa that would accept pets as we were bringing our Maltese, Jaxson, with us. We chose 1383 Pelican Watch and found it to be perfect for our needs. It was clean and comfortable and had all the necessary ammenities. My favorite part of the villa has to be the window seat :-) Perfect place to read when not at the beach. We love Pelican Watch and have stayed there many times. Highly recommend it. Just go....you won't be disappointed!! Great R&R for adults with dogs! We particularly enjoyed the unit where we stayed. We found it exceptionally comfortable and serene. It also had all amenities we needed plus some! Thanks for the help in matching us with this unit. Great sunsets from the deck! This is a great place to relax and enjoy a natural beach. We drove into Charleston nearly everyday and enjoyed all it has to offer. Don't miss the Angel Tree, which is very close by. The Charleston Tea Plantation is only a short distance and was a favorite of ours. Our best time was relaxing on the beach and being able to look out the glass doors of the villa and see the ocean. We ate our meals on the deck with the beautiful natural landscape and ocean for a perfect setting. The villa was spotless and well kept. Our only complaint was the quality of the sofa bed. It was not very comfortable for our daughter who isn't very large. It would be very uncomfortable for a bigger person or couple. This was the only negative, everything else was wonderful! Turkey, beach, dolphins, football, deer and view....what a great Thanksgiving. This unit is awesome. Had breakfast on the deck every morning with the deer strolling by, sunsets with the dolphins. Well maintained unit with one of the best views we have experienced in our 10 years of visiting at Pelican Watch. Kat at Seabrook Exclusives is the best at making sure all the details are covered,her follow up and professionalism is outstanding and just adds to the experience. Highly recommend. Wonderful getaway in a beautiful place. We really enjoyed the convenience of the villa and the view of the ocean. We brought our dog and he was very happy to stay out on the porch (fenced in) and take long walks next to the nature preserve. The villa had all the kitchen necessities and the TVs and wifi made for a very comfortable and relaxing time. The pool and fitness center at the Lake House were great! We loved biking around the island. We thought the restaurants were quite good and the Fresh Fiels Village Center had great stores and restaurants. Perfect! You may have received a half completed review. The main point: everything was great-- three generations of ozonoffs live that unit and wish it was ours! Everything was perfect with teh exception of the gestapo local law enforcement that stopped me the minute i arrived and passed through the gate. I received a speeding ticket for going 31 in a 25. Really was not a good way to start out the vacation. $50.00. Other than that everything was perfect. Great location and Property managers were awsome and very responsive. 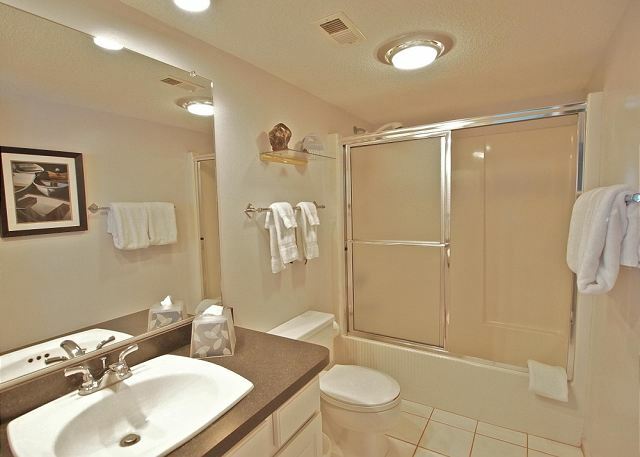 Unit could use some updating--Old TV, low bath cabs, etc. loved our location and the experience, enjoyed the club house and really loved the pool area. The view from the property is great. The furnishings were adequate; however, the kitchen was not well stocked. That is, there were very few pots/pans/other cooking supplies. There is no large pot (to boil shrimp or pasta) and no pans for roasting or cooking anything in the oven. This is the first time I have rented a property thru Seabrook Exclusives with this issue. Last year I cooked Thanksgiving dinner in a Pelican Watch kitchen with no problem! I could never to that in the kitchen in 1383. I strongly suggest that the owner upgrade the cooking supplies. Absolutely fabulous. Enough amenities, but not too busy. A little pricey, but high quality location and amenities/things to do if you are looking for low key vacation. This end unit location gives views from both sides and has a window seat. Great place to relax with our small dogs. 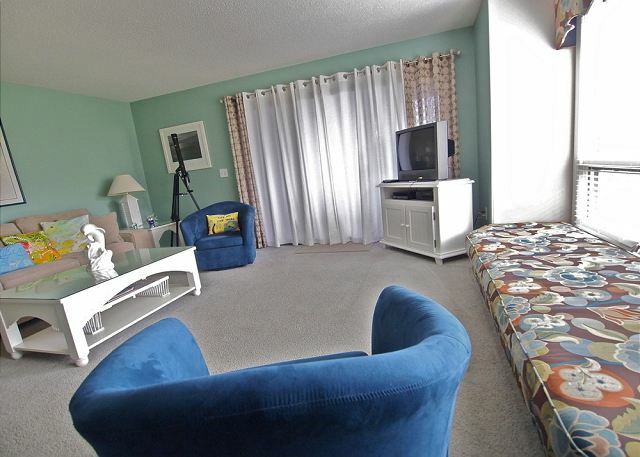 This condo was perfect for me (and pooch) as a single person but would do nicely for an extra guest or a couple. 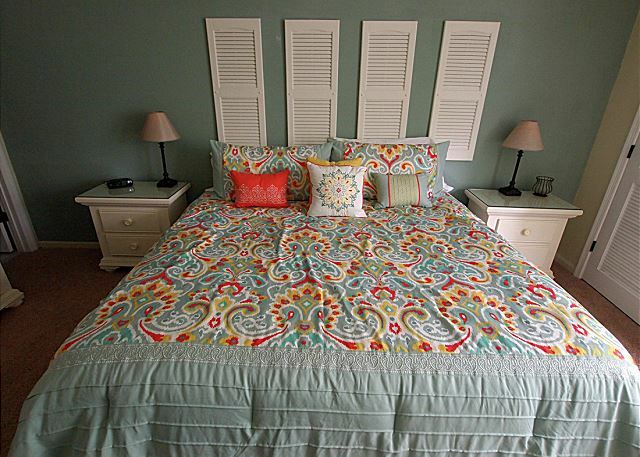 It was bright, charmingly decorated and completely equipped. Location ideal. I loved it all! Pleasant stay at comfortable condo. The large frying pan needs to be replaced because of the warped bottom. Otherwise, we had a wonderful stay. Great if you don't need to use the internet. A bit pricey. Nice location and fabulous view. The internet connections did not work appropriately. We were required to have an account number and password for Comcast, which of course, we did not have or could obtain on the weekend. Rental is pet friendly but you must very carefully adhere to the rules of where you are permitted to walk your pet. The permanent residents will not hesitate to tell you what you can do with your pets, so don't worry. If you don't need to use the internet on vacation, this is a great place. In spite of the high price of this rental, we would consider renting again. Thank you so much for your recent stay with us . I am so sorry you had trouble with the internet Mr. Robinson! The internet log in information was posted on the refrigerator and on the modem on the desk. We are always available to assist our guests in house too. Please don't hesitate to call us for assistance with internet or anything at all. such a very good place! clean and sooo comfortable! loved working with Susan... everyone we spoke with there was very helpful!